Is there any dangerous animals in Greece? There are supposed to be scorpions, though in about 15 holidays in Greece, I've never seen one - I believe their bite is painful rather than lethal I've seen the odd snake squashed on the road but they are probably more scared of you than you are of them. The most dangerous "beast" you need to beware of is is probably the motor car! There are scorpions - but in 22 years of which I've spent about 18 months in Greece I haven't seen one. Mind you, I hadn't seen a snake for the first 19 years and ever since kicking one (by mistake) in Paxos in 2004, I seem to come across one on each holiday!! I do understanf the millipedes (40 footed ones according to the Greeks "sarandapodhilia") have a very painful bite - so best to leave them well alone! My personal experiance of dangerous beasts in Greece are mosquito's, for some reason I am extremely tasty to them but what makes it worse I have a reaction to the bite. During our travels in Greece we have seen several snakes squashed on the road, and only the tail end of one as it slithered away in the undergrowth. Chris (hubby) did once get bitten by a small (about 8 inches) millipede, but thankfully it did no lasting harm. We were later told by locals that it was only a baby! In 25 years of Greek holidays I have only seen 2 scorpions and they were both dead. However when staying in Hanioti a lady in our hotel was stung when she picked up a towel she had used to block a gap at the bottom of the door. The proprieter took her to hospital but she was fine. We have seen many snakes often large and frequently dead on the road. On the road between Lindos and Pefkos dozens of snakes lay on the tarmac very early in the morning to absorb the heat. I've never heard of anyone being bitten. Have a look at this thread - we agreed to disagree! We stayed in a villa in Stoupa (mainland Greece) a couple of years ago and found a brown scorpion on the wall in my sons room It was bit scary as we didn't know if it was dangerous or not but my hubby was very brave he caught it in a towell and put it outside. We did check every day after that though it definitely made us a bit more wary! While we're on the subject does anyone know if the Praying Mantis is ok to handle? 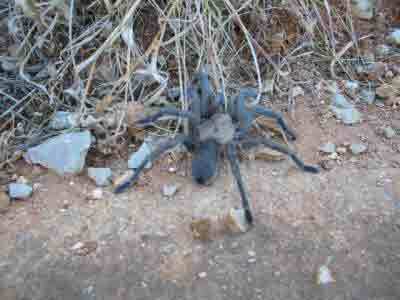 We had one on our cupboard door in Crete and he/she was a very scary looking creature! Well - I had one crawl up my arm in Crete and my arm's still there - although I've got a few more grey hairs! Think they look scarier than they are....or at least that's what I keep telling myself! Thanks Elenitsa actually even if they are quite safe I don't think I'd be brave enough to pick one up - they look at you as though they're planning something! A bit too scary for me! In the early 1990's on Skaithos we saw plenty of Live and Dead snakes. As we had young children at the time we were fairly concerned as one type has venom which could affect children so young. I have to say that we visited the same Island 2 years ago and saw none. This I think has something to do with the massive build-up of the coastal resorts which has taken place over the last 15-20 years. Saw a scorpion when we were in Crete, while we were at a show one evening, lots of comotion and a scorpion on the floor at the front of the audience! When we were in Kos there was this huge spider on the ceiling on our landing, it was about 6" across. Apparently it 'lived' there!! I told the reception about it and all they said was " oh they're harmless - there's loads of them about"!!! Think they were called sand spiders, made me feel quite sick!!! Needless to say we checked our room over every night!!! stop worrying girls we're actually talking about Greece here not Australia!!! In 20 years I have seen a few dead snakes, one live one (Corfu) but never a scorpion! The only damage I have ever sustained from wildlife in Corfu is from the mozzies! I have never seen spiders as big as the ones we saw in Greece. The first time we encountered one was on a menu board at the Italian restaurant in Haraki. It was huge god knows what it was but we told the lady who ran the restaurant she tutted and flicked it off with a pen.... we asked if it was dangerous she said arh no but they bite!!!! eeerr. We saw them again in Stegna last year on the wall of our little bungalow I am sure I could see there teeth even though I couldnt get that close. If anyone knows what they were let me know,as I am sure I have seen them on the web (ha ha ) before and they are poisonous!!! BEen to many Greek Island and once to the main land seen lots of snakes alive and dead not spiders. Think you are reasonablely safe in Greece. kmann, all spiders can bite or they couldn't manage their dinner. You ask about the big spiders. Was it this one? He lives in the Southern Dodecanese. He is very handsome, isn't he, but he is NOT venomous and can be picked up . Elenitsa will probably have seen a few of these. Greek islands, which for historic greek style ? Diving on any Greek Islands?